Which pays best? Staying in consulting or leaving? Consulting skills are extremely transferable. You work with some of the most capable people in business. The skills you develop are highly sought-after in the job market. one of the most appealing things about a career in a consultancy. Consulting is a classic option for those wishing to keep doors open. The most common path out of consulting is into ‘industry’ (by that, I mean a large-ish national or multi-national corporate). Typically, consultants join strategy or project management-type teams before transitioning into more operational roles later down the line. 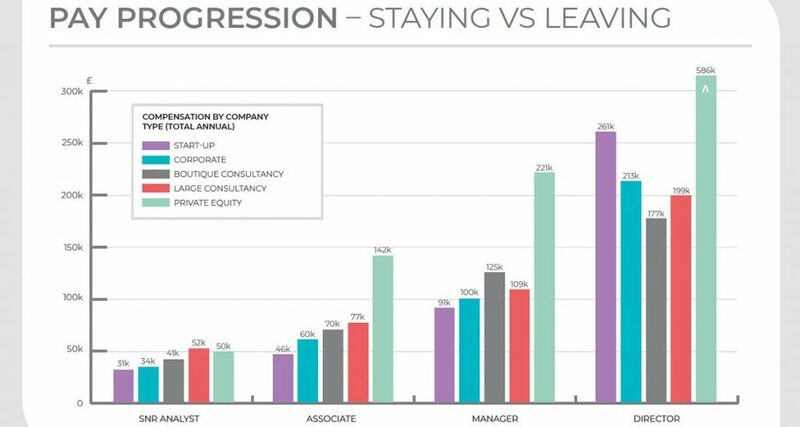 The “short-term pain” is that, at more junior levels, you will earn less in a corporate than in consulting (Senior Analyst [-35%], Associate [-21%] and Manager [-8%]). However, as you’ll have noticed, the gap narrows as you become more senior. It reverses at levels above Manager – the “long-term gain” – where, on average, annual compensation is 7% more than in consulting firms. The reversal described above is driven by the different compensation structures. In a large consulting firm at levels above Manager, 92% of total compensation is a ‘cash’ element (i.e, basic + bonus). In a corporate, it’s just 73%, with the big difference being the value of share allocations. Another point of interest is that share allocations don’t tend to kick in until you are more senior than Manager. Shares represent 19% of total compensation at these levels and only 5% of total compensation as a Manager. So when you are considering an offer from industry, make sure you ask about / negotiate in a long-term incentive programme (LTIP) which grants you shares. Over recent years, start-ups and scale-ups have become very popular destinations for consultants. With growth stage start-ups receiving 24.59% of applications. On movemeon, jobs in these industries are the most frequently posted types of opportunities. However, you need to be realistic about what you will be paid. Start-ups cannot afford to pay the best salaries. Neither do they have to, thanks to their popularity. So the pay advantage of staying in consulting is even starker at junior levels than compared to corporates. At Manager level, for instance, pay in start-ups lags consulting by 20%. That said, joining a successful start-up does pay back if you stick with it. At levels more senior than Manager, the value of start-up packages is 31% more than their consultancy equivalents (and 7% more than corporates). The make-up of those packages, however, is extremely complicated. Only 30% of the value in a start-up is realised as cash and 63% relates to equity. So if that’s important to you (for example to pay your mortgage and meet all your monthly out-goings), staying in consulting or moving to a corporate will prove more “liquid”, even if the total value is exceeded by a successful start-up package. PE remains a very popular option. But it’s often assumed that salaries are higher than in consulting. This is the case to a certain extent, but perhaps not as much as you’d expect – in the 10-15% range at Senior Analyst, Associate and Manager levels. Where there is a big difference is in total compensation. Managers average a ~60% bonus in PE versus a ~15% bonus in consulting. And whilst PE Managers rarely benefit from carry, the value of this at more senior levels is, on average 1.8x salary and/or the valuation of basic + bonus combined. If you are interested in a career in Private Equity, here are 29 questions that you should ask to ensure you make an enlightened decision. If you are interested in receiving the full report, please let us know by completing this form.